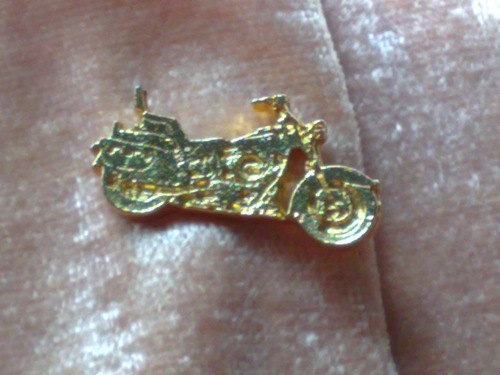 In a corner of my jewelry box, tucked inside a fold of pink velvet fabric, lies a small, gold-colored pin in the shape of a motorcycle. Someone on Texas Governor Ann Richards’ staff handed me that pin during a particularly broiling day on the campaign trail in the summer of 1994. I was a business reporter for the Dallas Morning News and had flown that morning to the Texas border town of McAllen to watch her speak and to wait in the wings until I could interview her on the flight back to Austin. It was well past dark, but her trademark bouffant was still impeccable when she finally climbed into the small plane, slid wearily into a bench seat, and then used her toes to push her shoes off under the table between us. Looking back, it’s clear that was a pivotal moment in history. Richards’ race for re-election against challenger George W. Bush marked the first statewide election since the 1991 demise of the Dallas Times Herald, where many of us worked in the 1980s. Over on the Gulf Coast, the once powerful Houston Post was taking its final gasps on life support, thanks to the blood-sucking ways of Billie Dean Singleton. In the spring of 1995, Hearst Corp. would buy the Post’s corpse and eliminate any competition for the legendarily lethargic Houston Chronicle. In South Texas, Hearst had already bought the San Antonio Express-News from Rupert Murdoch in 1992 and then extinguished its own paper across the street, the Light. It was the end of the great Texas newspaper wars, a 20-year run that began when Los Angeles-based Times Mirror bought the Times Herald and lit a fire under the newsroom, releasing an energy that produced some dazzlingly superb journalism there, across the street and across the state. Snuffing that spirit marked the beginning of the overthinking, overcautious, underdelivering, arrogantly boring era of newspapers. The survivors embarked on a death march to become the least offensive to the powers-that-be and the most irrelevant to their readers. She’d gotten a motorcycle license for her 60th birthday (here’s a picture) and the Monthly immortalized (and romanticized ) the moment. Richards was tougher than leather. She could wield words like a stiletto, and never lose her smile. “Poor George. He can’t help it. He was born with a silver foot in his mouth,” she famously said of George W.’s father during her keynote speech at the 1988 Democratic Convention. But that night on the plane, she was the opposite of a sound bite. Asked about “bidness,” as some called it in Texas, she talked about education. She couldn’t say enough about the importance of investing in children’s education today to ensure the economy’s health tomorrow. The former schoolteacher didn’t lecture, she just talked. I remember being struck by how much “there” there was beneath the silver hair. While the engines droned on through the dark Texas sky, Richards the philosopher spoke clearly, thoughtfully, and in long, articulate sentences that showed her deep appreciation for the complexity of people, the economy, the state of Texas and life. That didn’t interest my editors in the least. My first draft, which quoted her extensively, was, in their view, not properly critical. To rectify that, the story went through the food processor of a committee-edit. What emerged included one paraphrase of one sentence from Richards, lots of remarks from her “critics” and a statement in her defense from an aide. The editors were then satisfied that the story was suitably fair and balanced. The story that was published did many things, but it didn’t tell the truth. Ann Richards lost the election. She was replaced in the governor’s mansion by a swaggering young man who pretends to this day to be a Texan. In March of 1995, the New York Times Magazine published a lengthy question and answer article on some newly private citizens, including Richards with New York’s Mario Coumo and Lowell P. Weicker Jr. of Connecticut. My husband read that piece at the time and pointed it out to me as something worth reading. “I had no idea she was so philosophical,” he said. I winced, wishing for a do-over. In the years since then, the little motorcycle pin hasn’t tarnished. But newspapers have continued to shed their luster and their verve, going out of their way to avoid the kind of smart, fearless journalism practiced almost to her dying day by my onetime colleague, Times Herald alum and loyal friend of Ann Richards, Molly Ivins. Without the truth serum of competition, the ideal at newspapers seems to be toothlessness and truthlessness. Stories are recitations of “he-said, she-said,” while a sanctimonious cloak of objectivity is supposed to somehow justify the lack of context, perspective or real meaning. Any article that dares suggest straightforwardly that the president is lying is tucked into an inside page. If the truth gets out, perhaps that is because the reporter slipped the essence of the story in the graphic next to the article to “sneak” it into the paper, as a friend of mine once did at the Dallas Morning News. Because thanks to the moveable type of publishing technology, the competition’s back in town. And they will win readers away with the simple siren song of truth.